Every now and then, we hear someone singing odes to the beauty of Pakistan’s North-West regions. Be it by one of those recent sing-along tourism promos running on nearly every news network these days, after a prolonged wave of violence in Malakand Division, or some bunch of local yahoos who’d just returned from a trip from any of the numerous valleys and lakes. The fact remains that the actual beauty and splendour of these areas is still quite underrated, despite all such praises. Even though the last few years’ armed conflicts have labelled the entire region as a no-go zone, especially in the minds of foreign tourists, the government along with its various tourism departments and foreign donors has been trying in vain to rekindle the industry, only to be hit by one calamity after another. But after, and still, suffering through a horrific wave of militancy and, only recently, the devastating floods, it’s the unflinching spirit and hospitality of the people that has made places like Buner, Swat and the whole of Malakand Division generally so much more timeless and endearing. With epic vistas of crystal lakes nestled between the green, snowcapped mountains of Kohistan on one side, it’s an experience that is truly felt within the very depths of one’s soul – if not just through one’s senses. The fresh alpine smell, the cool untainted air, along with actual mountain spring water, all quite surprisingly exist within the borders of our very own country. Even though you hear about it often, you never really fully understand it until you yourself are standing there right in the middle of Chagarzo Valley in Buner district, with nothing but the vault of the clear blue sky, mostly overshadowed by clouds being challenged by those majestic peaks. The farther up one goes, the more one is challenged by nature at its finest. Even when starting the journey up the Chagharzai road (one of the new six tehsils in the district), located at a distance of over 100 kilometres from Sawaray, one is greeted to a splendid change in scenery, even when going as far up as Shangla. Then on to Shehdiser, which is at around 8,000 feet above sea level, from where on only four wheeler jeeps, the non-customs-paid, CG 125, diesel-run kind, can tackle the teetering slopes for a memorable ride up to the string of beautiful areas in the region. Only when one has experienced that thrilling jeep ride, or on motorbike with skilled drivers through sharp ravine sloping down to a joint, making ways from different springs at the middle, and the daunting mountings jutting out on both sides, one from the Hazara Division, second from Shangla, third from Swat while fourth from Swabi, that one can truly claim to have adventured up the fantastic North-West. The ride up from Swat to Buner and Shangla, over precarious mountain passes, is a trip that deserves a solid place on anyone’s bucket list. Unfortunately, in the Chagharzai Valley there are no motels or cafes to cater specifically to the tourist industry. But nothing can match experiencing for the first time, the thrill of the adventure and the magnificent weather, even in the searing heat prevalent in the settled parts of the Khyber-Pakhtunkhwa(K-P). Wrapped in local tales, stunning views and a splendour of its own, this area is nestled up at nearly 8,000 feet, and the tourism industry of the area needs the attention of the government to lure in local and foreign tourists. And just when one’s taking in the whole journey along with the spectacular view, the locals of the area would cheekily smile and say how there are even more beautiful areas, if one was to adventure even higher and farther away from commercial conveniences and unsightly pollution. After traversing through even more precarious, yet breathtaking heights, alpine forests and vast green plains does one take a step back in time. Where, beyond the odd rooftops made from shutters or vague tire tracks, there’s no sign of modern development. No roads, no electricity, no cell phone signals – a place where one is in the truest sense isolated from the troubles and cares of the world. With fields of brightly coloured flowers, and wild goats grazing on top of the mountains, it’s almost unreal considering the kind of world one comes from to these places. And to see all that beauty reflected so perfectly in the still, silent waters of the lakes is an epiphany in itself. Seeing the locals living their lives with such simplicity is a sight of relaxation on its own. Local farmers, herders, craftsmen all living as they have done for centuries, some even in complete isolation. It’s only when one tries to perhaps picture oneself through their eyes that one’s cares and troubles come into perspective. When one’s love for family, good company and the simpler bounties of life such as good health or just the realisation of being well and alive are truly appreciated. 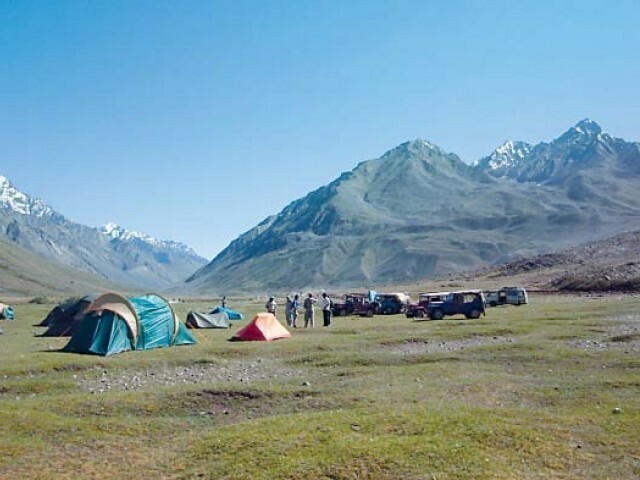 Be it a place to kick back and relax or a place where enthusiasts can go fishing, hunting, or hiking on any of the splendid hills or mountain passes, the Chagharzai Valley bears testament to the heights of inspiration that can be found in our country. In my mind the problem is not the hills, mountains, lakes , waterfalls, butterflies, friendly village folk etc…….but the lack of amenities that go to make a visit pleasant.